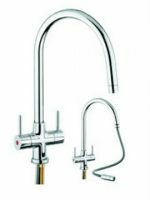 Pull Out kitchen taps have become an increasing popular choice in British homes in recent years, bringing a touch of a ‘professional’ kitchen to a domestic setting. 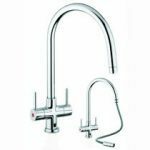 We offer the top pull out kitchen taps designs from leading manufacturers San Marco and Carron Phoenix, for anybody seeking the added functionality and versatility that a pull out nozzle brings. 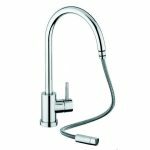 Best of all, as the UK’s leading supplier of pull out kitchen taps, we guarantee that our prices are the best you’ll find from any UK retailer. Our range of pull out kitchen taps, with their stylish pull out nozzles, encompasses both sleek design and added functionality. Most are designed and manufactured according to the classic ‘swan neck’ spout model, but in a manner that’s equally accessible to any kitchen design, ranging from rustic traditional to contemporary chic. For a different look, there’s also the minimalist Carron Phoenix Nautilux, with its minimalist styling being particularly attractive for a modern kitchen. 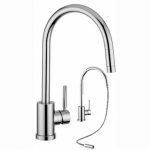 The Nautilux is one of our single lever pull out kitchen taps, while others include the Carron Phoenix Aros and the San Marco Elmira. 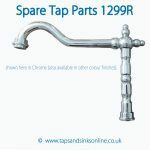 If you prefer to choose a double lever pull out kitchen tap, consider the San Marco Emporia and Carron Phoenix Averon. Whichever of our pull out kitchen taps you choose, you can be assured of a restaurant-style touch in your home, and perfect operation for many years to come – with a full guarantee of up to five years to fall back on in the extremely unlikely event of a problem arising. 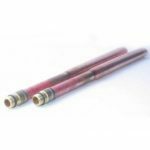 All of our pull out kitchen taps have been engineered specifically for use in the UK, and can cope with situations of low water pressure. All come will all necessary fixtures and fittings included. 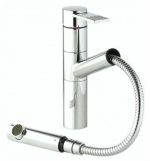 And all are for sale here at cheaper prices than any other UK seller, so we look forward to taking your order for pull out kitchen taps today.